At Farah's 50th Birthday bash, Kangana wore a fuchsia Gucci suit. 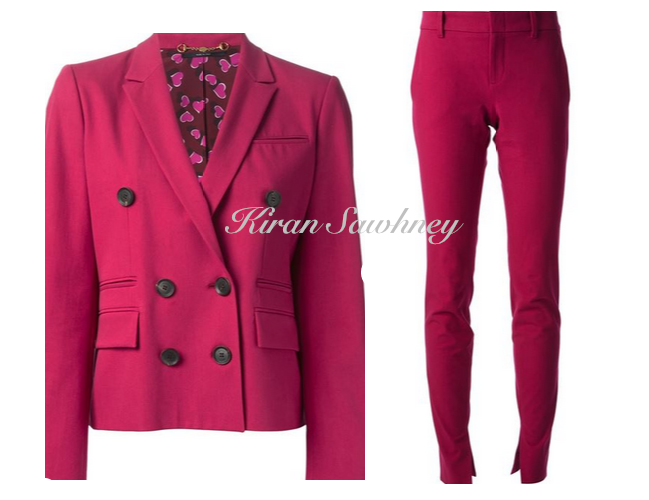 It was a cropped double breasted blazer from Gucci featuring notched lapels, a chest pocket which is priced at $ 857 and Pink stretch cotton slim trousers from Gucci featuring a concealed front fastening, belt loops, side pockets, a regular length, rear welt pockets and ankle slits, priced at $378. She wore it with polka dot black shirt and Louboutin pumps. We love her crisp look.